Subscribing to a calendar means you do not have to add a calendar each year and if holidays change, then the calendars will refresh weekly, so that your calendar always has the latest view. 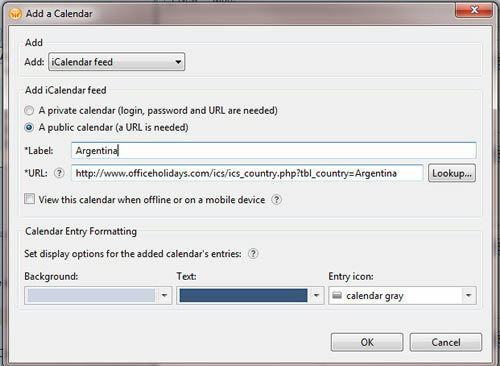 While there are public holiday calenders available in Outlook and Google Calendar, calenders from www.officeholidays.com offer extended information by showing regional holidays, highlighting non public holidays and giving a short description on each holiday. Click the 'highlight text button below then press Ctrl+C (PC) or Cmd+C (OS X) to copy the link. If you want, you can change the calendar name and colour and change the Auto-refresh frequency to Every day from Every week, then click OK.
To add the calendar with default settings, click Yes on the next dialog. If you wish to edit the setting, click 'Advanced' and go to step 6. In the Advanced dialog box, you can optionally rename the calendar. Ensure the box is checked in the Update Limit section. In the left column, click on the down arrow to the left in the Other Calendars section. From the menu select Add by URL. 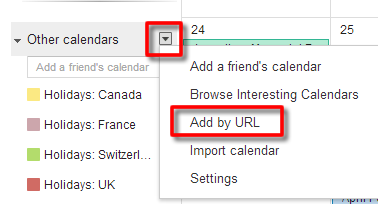 Enter the feed URL in the dialog box then click Add Calendar. NB. You cannot set how often the calendar refreshes. From the add drop down choose 'iCalendar feed' and select the 'A public calendar' option. Change the Label (name) and colours as required.